Liz Tecca dribbles past a defender on her way to 1000 career points. 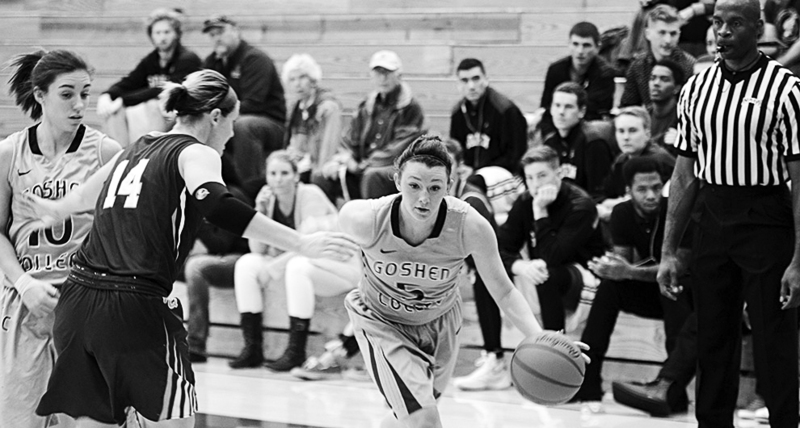 Liz Tecca is senior on the Goshen women’s basketball team from Kalamazoo, Michigan. On November 3rd, Tecca became the 13th women’s basketball player to score 1000 career points in a victory over Aquinas College. How does it feel to hit 1000 points and be a member of that select group? It feels pretty good. It feels good to know that years of hard work is paying off and kind of just a milestone to check off the list. It’s been good! You started the game against Aquinas at just six points shy, so were you mentally checking off how many points where left after each time you scored? I knew the number but I was trying not to think about it and just focus on the game but it was there in the back of my head. And with six being a small number it was easy to keep track of and not worry about too much. Going back to your statement of years of hard work paying off, could you talk a little bit about your background in basketball before Goshen? I started playing basketball when I was in third grade, so when I was about eight years old. I’ve played ever since then with youth leagues and middle school and high school. I played for Parchment High school which is kind of a small school. I graduated in a class with 130 students, so we were class B. I played AAU [Amateur Athletic Union] all through high school and I got recruited through the AAU program. That’s how I met Coach Miller and ended up at Goshen. You’ve been a member of the basketball team for three full seasons now, have you noticed a change in the mindset or feel of the program over that time? Definitely. My freshman year we were not very good, we only won three games. In my sophomore year we only won four games. There were times where it was a little difficult to show up and work hard when we were constantly getting beaten. We knew we had the tools to win, but we just couldn’t get over the hump. Last year we had maturity and experience and knew how to handle situations to go along with upperclassmen with talent and that was really the tipping point. Now this year compared to freshmen year is totally different. We come into games expecting to win. In previous years we were hoping we would have a chance to sneak away with a win. What goals, both personal and team-oriented, do you have for this season? Overall for the team we really just want to improve on last year. We finished 19-11 last year and we want to get to 20 wins. We want 11 or 12 conference wins and to finish in the top four of the conference. That’s a big team goal. Personally, my goal is to do what I can to help us get to that point where we’re hitting the team goals and winning conference games. Last year our team goal was to get to the conference tournament and now we want to win in the tournament and get to the championship game and see what we can do in the postseason.